Writer Henry James (1843–1916) was born in America but preferred to live in Europe; he finally become a British subject near the end of his life. His status as a permanent outsider is responsible for the recurring themes in his writing dealing with European sophistication (decadence) compared to American lack of sophistication (or innocence). He is respected in modern times for his psychological insight, for being able to reveal his characters’ deepest motivations. These 11 essays, along with an introduction and an afterword, examine James’s work through the prism of the author’s latest style. Topics the contributing authors address include the Henry James revival of the 1930s, three of James’s male aesthetics, women in his works, literary forgery, and parallels with the career and views of Margaret Oliphant. Three essays delve into issues of representation in art and fiction, then three more explore decadence, identity and homosexuality. Review: The essays in this stimulating collection consider some of James's reactions to "British Aestheticism (and decadence) of the late Victorian period," showing how James "interpreted the English upper class and their--to him--decadent morality and attitude through his writings." Individual essays treat such topics as James's portraits of decadent men (Gilbert Osmond, Mark Ambient, Gabriel Nash) and of the women isolated by such aesthetes (as in "The Author of Beltraffio"), and his literary relations with well-known contemporaries like Margaret Oliphant and Max Beerbohm. James's attitude toward homosexuality and aestheticism--as revealed in his view of the work and career of John Addington Symonds and, more especially, his sometimes rivalrous relationship with Oscar Wilde--is, inevitably, central to the story of his engagement with the aesthetic movement in Britain. A reevaluation of Isherwood's literary achievements in the light of his Vedantism. Nominated for both Phi Beta Kappa and MLA awards in Literary Criticism. Christopher Isherwood: His Era, His Gang, and the Legacy of the Truly Strong Man is a lively and well-informed study that integrates Isherwood's social and historical context with the themes and methods of his writings. It is as illuminating about the writings of Isherwood's friends W.H. Auden and Edward Upward as it is about Isherwood's novels and his journals and his writings on Vedanta. The first study of Christopher Isherwood since the publication of his diaries, David Garrett Izzo's new book demonstrates how Isherwood amde his life into his art. Using Insights from philosophy, psychology, and mysticism, Izzo examines Isherwood's work and his influence on friends ... such as W.H. Auden and Stephen Spender and on future generations. Izzo has made a significant contribution to Isherwood's legacy as his centenary approaches. --James J. Berg and Chris Freeman, editors, The Isherwood Century and Conversations with Christopher Isherwood. --D. A. Barton, California State University Long Beach. David Izzo's biography of Isherwood is part bio, part summary of the author's work, part in-depth literary analysis, and part spiritual philosophy. It's an impressive and interesting book. This is because Izzo's style manages to weave together so many themes and so many sources and because his subject had done precisely the same thing with his own life. It becomes clear very early in this book that Christopher Isherwood and his gang were remarkably self-aware and self-analyzing. We discover that from very early in his life, Isherwood was treating his own experience as matter for journalism. His father, Frank, who was killed in WWI in 1915 when Isherwood was only 11, had "published" a family newspaper called "The Toy-Dra wer Times" every morning, illustrated, about young Chris's life. His mother, Kathleen, helped him write his first "book" at age 6 called The History of My Friends, turning history into personal myth and fantasy. In his last year at St. Edmund's Preparatory (high school), he met a boy who would change his life forever, alter the course of British literary history and give name both to the gang of friends and an entire generation, Wystan Hugh Auden. At St. Edmund's he also met his life-long friend and first collaborator, Edward Upward, with whom he wrote a series of subjective and obscurantist stories, peppered with nonsense words and set in a fantasy world called Mortmere. Throughout his life, Isherwood continued to craft fiction based on these early experiences. He wrote about himself and his friends in the third person, sometimes using pseudonyms. He commented on history and meaning by placing himself and his experiences in the center of a fictionalized world. He also kept diaries and later in his life wrote commentaries about his own work. And, because he and Auden and their friends Stephen Spender, Cecil Day Lewis, Louis MacNeice, etc. became important literary figures and popular writers, other people, critics and literary analysts, also wrote about them. Part of what is remarkable about Izzo's analysis is that he has managed to piece together and explain all the many perspectives on Isherwood's life and personality development. This phenomenon of writing about himself, only slightly veiled, is apparent in Isherwood's most familiar work The Berlin Stories which ultimately became the musical and movie Caberet. The story of William Bradshaw, British writer in pre-Nazi Germany, is the story of Christopher Isherwood in Berlin. The first dramatized version of the story was called I Am a Camera. That's precisely how he decided to report on what he'd discovered lurking behind the sexual liberation and sophistication. What isn't quite so clear in the literary creations is that Isherwood went to Berlin because of what Auden told him he'd find there: boys. Other people, critics and literary analysts, also wrote about them. Isherwood acts from love and tells the truth; he passes Tests and proves himself, but not out of fear or neurosis (Isherwood and his gang grew up in the newly psychologically-sophisticated world announced by Sigmund Freud); his self-consciousness allows him to tell the truth. The Truly Weak Man acts from fear, in order to hide, turning self-consciousness into self-absorption. Two pivotal experiences in Isherwood's later life were meeting Swami Prabhavananda, the apostle of Ramakrishna who came to America to teach the Hindu-inspired wisdom of Vedanta, and Don Bachardy, the young man who would remain Isherwood's lover and life-partner from 1953 to his death in 1986.Isherwood's last book was My Guru and His Disciple. The title, of course, referred to Prabhavananda and Isherwood, speaking of himself in third person. It recounts the author's spiritual development and one-time effort to live as a Hindu monk. Though he preferred life with Bachardy to life as a celibate, he turned the quest to be Truly Strong to that to be truly spiritual and to live out of religious wisdom. David Izzo's analysis of Isherwood's life and quest is impressive. As I try here to review it, I discover it's so rich in detail it is almost impossible to summarize. That's both its strength and its weakness, the problem created by Isherwood's self-conscious, self-analyzing, self-referential style. It's hard to keep track of what was real and what was fictionalized, of who was Isherwood the man and who was Isherwood the character, acting under pseudonym. Readers and fans of Christopher Isherwood's are likely to thoroughly enjoy this book, finding in it a level of meaning they may not have seen in the writer's creations. The casual reader may find it daunting, but at the same time intriguing. It inspires curiosity and reverence for the life of a homosexual man, born in a time when that was still totally verboten, who becomes, partly through spirituality and partly through his commitment to honesty and self-analysis, Truly Strong. For fifty years, the American Richard Stern has been praised as a “writer’s writer.” His collected stories in Noble Rot 1949–1989 earned him a Book of the Year Award from the Chicago Sun-Times, adding to his recognition as one of America’s most acclaimed writers of fiction in novels and short stories. 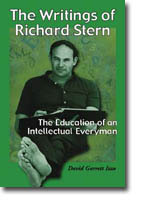 This study of Stern’s life and writings discusses major themes Stern has dealt with, explores the issue of fictional autobiography as it relates to Stern’s work, and analyzes each of his published novels and short stories from Golk (1960) to Pacific Tremors and What Is What Was (both 2001). An interview with Richard Stern is included. W.H. Auden’s life and work were perhaps best explained and condensed in the words of Edward Mendelson, Auden’s literary executor, when he remarked, “[Auden] grew up in a household in which the scientific inquiries of his father maintained an uneasy truce with the ritualized religion of his mother.” Indeed, science and religion were dominant themes in Auden’s life and work, which for him were oftentimes one and the same. Auden was hailed as the new T.S. Eliot and as the “coming” man, greatly influencing the future generations of angry young men with his thoughts on science, religion, and the relationship between the two. This book is an exhaustive reference to W.H. Auden. Those new to Auden and his writing will find the work a comprehensive introduction, while Auden scholars will appreciate the quick access it offers to the details of all his poems, plays, libretti, and other pieces of writing. It also includes entries on the people who were closest and most important to Auden, including fellow writers Christopher Isherwood, Stephen Spender, C. Day Lewis, Edward Upward, and T.S. 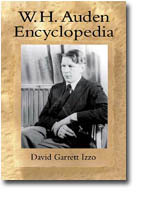 Eliot, as well as significant events in his life, such as his arrival in America, his vision of agape, and his search in science and religion for answers to the deep questions of life and existence. 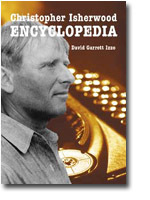 This comprehensive and accessible reference work will serve Isherwood scholars who need quick access to people, places, novels, stories, essays and plays, introduce Isherwood to those who know little of him, expand the knowledge of the literate general reader, and refresh teachers of literature with Isherwood details. Entries on Isherwoods most influential friends, including W.H. Auden, Aldous Huxley and Stephen Spender, are significant. Included are all of the monumental roles Isherwood exemplified during his lifewriter, rebel, gay-activist hero, and proud exponent of the Eastern philosophy known as Vedanta. Bold-faced terms and names throughout signify full entries elsewhere.